As the physical eye must be acquired in the pre-earthly life, so must the eye, for the perception of the spiritual world, be acquired here on earth through spiritual science, active spiritual knowledge. I do not mean through clairvoyance — that is an individual affair — but through the understanding, with healthy intelligence, of what is discovered by clairvoyant research. It is simply untrue to say that one must see into the spiritual world oneself in order to believe what the clairvoyants see. It is not so. […] We need only be prepared to think the thing out, and feel it through and through. It is this recognition by healthy human understanding, of what is given out of the spiritual world — it is not the clairvoyance, but the activity of knowledge — which provides us with spiritual eyes after death. The clairvoyant has to acquire this spiritual eye just the same as other men. For what we gain by Imaginative Cognition, what we perceive in seership, falls away and vanishes after a few days. It only does not do so if we bring it down to the standpoint of ordinary understanding, and in that case we are obliged to understand it in the very same way in which it is understood by those to whom we communicate it. In effect, clairvoyance as such is not the essential task of man on earth. Clairvoyance must only be there in order that the supersensible truths may be found. But the task of man on earth is to understand the supersensible truths with ordinary, healthy human understanding. 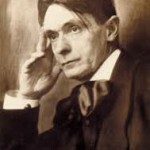 Dit bericht is gepost in meditation, Rudolf Steiner, Self developpment, spirituality. Bookmark de link.